Feeling like you need a new look for spring? 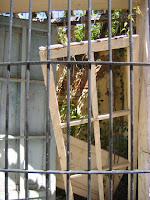 Something a little pushy and out of that confining rut you've fallen into? Up-and-coming Portland fashion designer Adam Arnold is presenting his spring collection for men and women at DWR this Friday. As noted in the press release, this collection was "inspired by Japanese design, the new wave cult film "Liquid Sky" and German disco punk." Perfect! Champagne and cupcakes will be served and space, as they say, is limited, so get your reservation in by e-mail. After all, as Fernando used to say, "It is better to look good than to feel good, and you look MAHVELOUS!" Details: Adam Arnold Spring Collection at DWR Portland. Fri., Apr. 4; 6:30 pm; free. Design Within Reach, 1200 N.W. Everett St. Phone 503-220-0200. Traveling, to me, is all about absorbing everything around me, from the scents to the tastes to the sounds and the textures, even the feeling of the air and the angle of the sun. Obviously the food is a big part of that, and I'll come home craving the flavors of the place, almost as if they've insinuated themselves into my physical makeup. Toasted sesame oil and fish sauce were the ones that stuck with me from Korea, seaweed and miso from Japan, choucroute from Alsace. 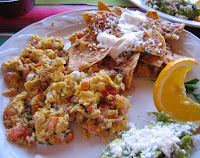 This morning we woke up with a yen for chilaquiles like those we had at Playa Bruja in Mazatlan, eggs scrambled with pieces of fried tortilla. Though we didn't have a red chile sauce to top them, there were corn tortillas in the freezer, and the makings for pico de gallo on hand. With no view of the ocean or the sound of the waves crashing on the beach to accompany the meal, they still managed to bring back, even if only fleetingly, the feeling of the place. Heat 2 Tbsp. 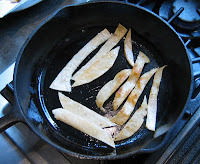 oil in frying pan and add tortilla strips a few at a time, browning slightly and removing to paper towels to drain. Break eggs in bowl and beat to combine. In a clean frying pan heat one tablespoon oil, add onion, garlic and pepper and saute till tender. 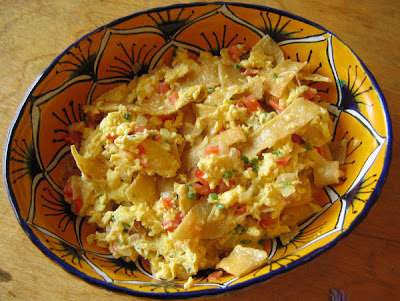 Add tomatoes, eggs and fried tortilla strips and cook till eggs are set. Season to taste with salt and pepper and serve with chile sauce or salsa. What Oregon needs are more year-round open air cafes with thatched palm roofs overlooking white sand beaches, don't you think? Playa Bruja, or Witch Beach, at the north end of Mazatlan's Golden Zone, is prime surfing territory and has a terrific cafe serving breakfast, lunch and dinner most days. There are also stands selling mango and melon on the beach, and a fellow who will pry open as many fresh oysters as you can handle for pennies each. We were at the Restaurant Playa Bruja for breakfast and had our choice of fresh-squeezed tropical juices or the rice, sugar, cinnamon and vanilla drink called horchata. Though most at the table wanted the mahi mahi fish tacos (above), which were stunningly fresh and moist, I'd been hankering to have some authentic chilaquiles. 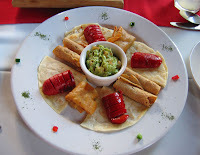 In this dish, fresh corn tortillas are fried and then covered with a green or red chile sauce and simmered until the tortillas soften. 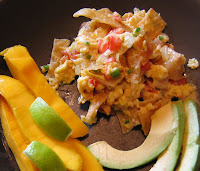 Scrambled eggs are often added, and the Restaurant Bruja version had the eggs, scrambled with pico de gallo, separate rather than mixed in, with the ubiquitous guacamole and refried beans alongside. There was, of course, a fine chile salsa, too, and more pico de gallo to spoon on. It was exactly what I'd hoped for, with the sauce-soaked corn flavor of the tortillas giving the eggs more heft and flavor. And since it's an easy meal to whip up for breakfast or even dinner, I guarantee you'll see this making featured appearances here at the homestead. Read the other posts about my trip to Mazatlan: The Historic Scene, The Mercado Central, The Fungus Among Us, Evening on the Plazuela Machado, Groovy Graffiti and Adios. 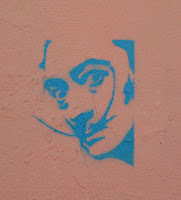 I've written about my fascination with street art, and on one particular street in Mazatlan a stencil artist has been creating work both insightful and exciting to look at. The signature "Stencileame! ", occasionally spray-painted alongside, is the only identifying mark, but this artist is definitely accomplished at his or her craft. 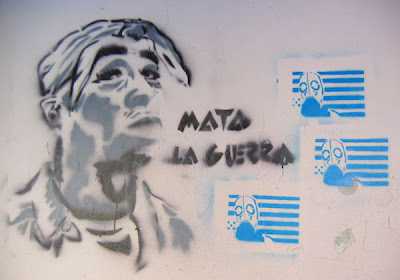 The piece above, with the words "Kill the war" next to the head, is approximately four feet wide by two feet high, but most are smaller like the Dali face on the left which is approximately eight inches square. This one (right) has the title "Fight against tele-garbage" and features the starfish character of Patrick from the Spongebob Squarepants cartoons with a board nailed to his head. There's also the usual tagging and spray-painted graffiti here and there, but these editorial (and graphic) personal creative statements really capture my attention. Read the other posts about my trip to Mazatlan: The Historic Scene, The Mercado Central, The Fungus Among Us, Evening on the Plazuela Machado, Bewitching Breakfast and Adios. OK, now that it's cold and snowing in Portland (!) I'm going to make you completely sick by sharing an evening we spent strolling through the Centro Historico on a moonlit evening, a light breeze causing the temperature to dip down to, oh, 78 degrees. The doorways were lit by wrought iron streetlamps, people were just beginning to leave their day at the beach to have dinner. What can I say? It was paradise. 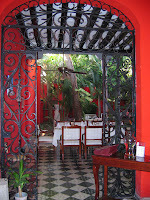 It was still a bit early for our table at the restaurant we'd chosen for dinner, so we wandered down the street to Topolo, a dinner house situated what was once a classic-style Mexican home. 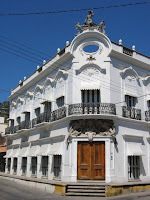 As I mentioned before, many homes in the Centro have been converted into commercial spaces without destroying the features that make them such amazing examples of vernacular architecture. The flat stucco fronts with shuttered windows that face the street, often painted in eye-popping (and fabulous) tropical colors, that, when you walk through the door, reveal private open-air courtyards with colonnaded patios used as dining or living areas (or both). Radiating off the patios are the interior rooms for sleeping and cooking or receiving guests. The whole structure is ingeniously situated to take advantage of both shade and any cooling breezes that might waft by, and the plants and fountains in the courtyard provide a sense of coolness and separation from the noises of the street outside. 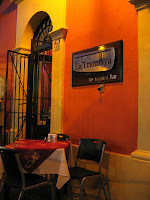 We had margaritas and a platter of house appetizers, including crunchy pork flautas, small chimichangas filled with tender beef and cheese, and quesadillas topped by sliced sausages, which gave us the strength to roll down to La Tramoya on the Plazuela for dinner. The lamps were lit, the vendors selling trinkets to the tourists were set up in the square and tables were starting to fill with a happy and tired beach-goers celebrating the long Easter weekend with their families. Once again I ordered the inky black huitlacoche, this time as a sauce over perfectly grilled medium-rare steak. Its earthy, tart flavor, much like a mushroom sauce with wine, made a luscious mouthful and a great pairing, especially with the spicy red wine from a Baja producer. The fish in verde sauce that Dave ordered came in a foil pouch that sent up a cloud of scented steam that was so tempting he had to share a bite with everyone at the table. After finishing our meals and working on the remains of the wine, we sat back and listened to the people chatting with their families and scolding their kids, the waiters joking with their tables and taking orders. It was a warm night and the voices, all in Spanish, blended with the music floating on the light evening breeze. A perfect vacation moment. Read the other posts about my trip to Mazatlan: The Historic Scene, The Mercado Central, The Fungus Among Us, Groovy Graffiti, Bewitching Breakfast and Adios. 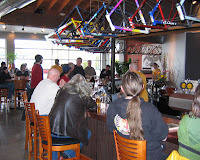 We got a table in the corner with a great view of the amazing bike-frame sculpture over the bar and ordered our first round from the selection of ten beers on tap plus two on cask. Christian came by and informed us that their two cask taps would always have the IPA and the other would rotate with seasonals. The incredible Kentucky Christmas ale, their Abominable Winter Ale aged in freshly emptied Kentucky bourbon barrels, is on now and has to be tasted to be believed. Rich, dry and completely quaffable, it's on my list of great brews. 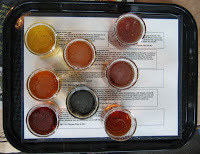 One of the party got the sampler tray that featured eight beers, six of their regular brews with two seasonals, and all were outstanding. Though Christian isn't known for making flavored beers, his Survival Seven-Grain Stout, finished with 15 pounds of cold-pressed Stumptown Hairbender espresso, is a must-have. The rest, ranging from a pale ale to their ESB, are all, as expected, well-made and among the best you'll find in this beer-crazy town. And the food? Well, I've been saying that what Portland needs is a pub with outstanding beer and outstanding food and, at this point, I'd have to say Hopworks' pub grub is at the top of the heap. We tried the papas fritas and the chicken wings from the very reasonably priced happy hour menu and found them excellent, the fried potatoes crisp on the outside and tender inside and the wings juicy and spicy. We also ordered two pizzas, one a sausage and pepperoni combo and the other a feta and artichoke heart pie, and both came out piping hot and delicious. And despite the crush of customers, the staff was efficient and responsive, keeping us well-supplied and happy. The beer and the food disappeared in no time, and we were making plans to return when the HUB-bub dies down a bit. 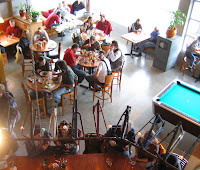 Details: Hopworks Urban Brewery, 2944 SE Powell Blvd. Phone 503-232-4677. For years I've been reading about huitlacoche, the Mexican delicacy made from a black fungus that grows on corn. So I was thrilled to see it on the menu at a restaurant called Copa de Leche on the Malecon, the beachfront drive in the old section of the city. 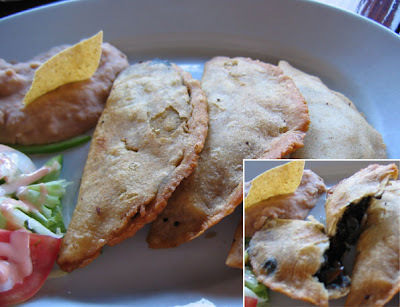 The huitlacoche was used as a stuffing in handmade empanadas, and came with sides of salad and refried beans. The filling had a tart, earthy flavor that was unlike anything I'd ever had before, and the crust of the empanadas was crisp and crunchy, a perfect pairing. 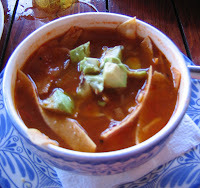 We also ordered a bowl of tortilla soup, a favorite from previous trips and one that I've made at home a few times. Simple to make if you start with a rich chicken or vegetable broth, simmer it with tomatoes, onions and garlic, then add strips of fried corn tortillas, chunks of avocado and lime juice just before serving. The crispness of the tortilla adds a lovely crunch to this flavorful soup, and it was almost as good as the definitive version I first tasted at the Red Cabbage Cafe in Puerto Vallarta. 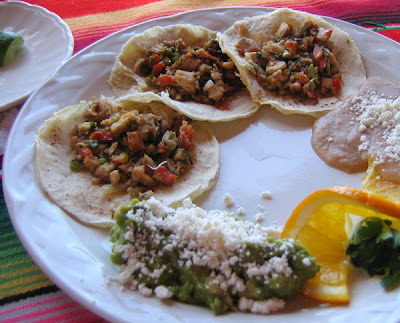 The menu also listed nopales in garlic sauce, cactus leaves that had been skinned, chopped and cooked in oil with whole cloves of garlic and sliced mushrooms. Terrific by itself, this would also be fantastic as a side dish with meat or in tacos with grilled meat and corn tortillas. The chicken in mole sauce capped off the meal perfectly, the deep red chile sauce with a hint of heat and tender chicken just begged to be eaten stuffed into bits of warm tortillas torn from the pile on the table. Sitting on the covered beachfront patio, sipping margaritas or a Pacifico with a squeeze of lime in it and watching the world go by made this a perfect spot to while away an afternoon, then head back for a nap before dinner. Vacations are such hard work! 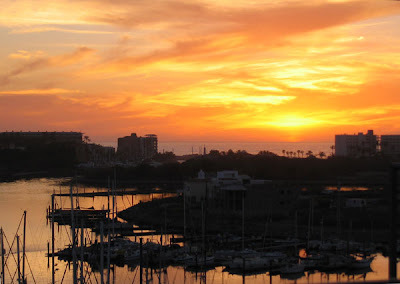 Read the other posts about my trip to Mazatlan: The Historic Scene, The Mercado Central, Evening on the Plazuela Machado, Groovy Graffiti, Bewitching Breakfast and Adios. Farmers' markets are a passion of mine. 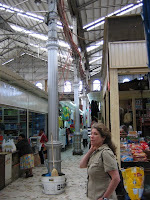 I can't get enough of the fresh-from-the-farm produce and meats, the bustle, the noise, the laughter. 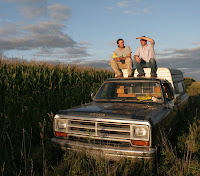 It's the idea of eating local, yes, but also having a relationship with the person who produces the food that you eat. A chef I interviewed once described the intimacy of making food for people, that the food he prepared would become part of them on both a physical and spiritual level. 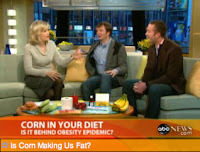 And many farmers I've talked to feel the same way about the food they grow. 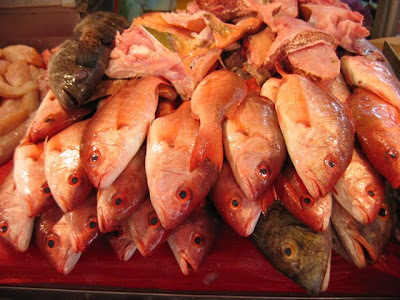 So one of my very favorite things to do when I travel is to go to the local market and Mazatlan's, while it's not one of the largest markets, has that same feeling of the place where the locals go to buy the food that will feed their families. 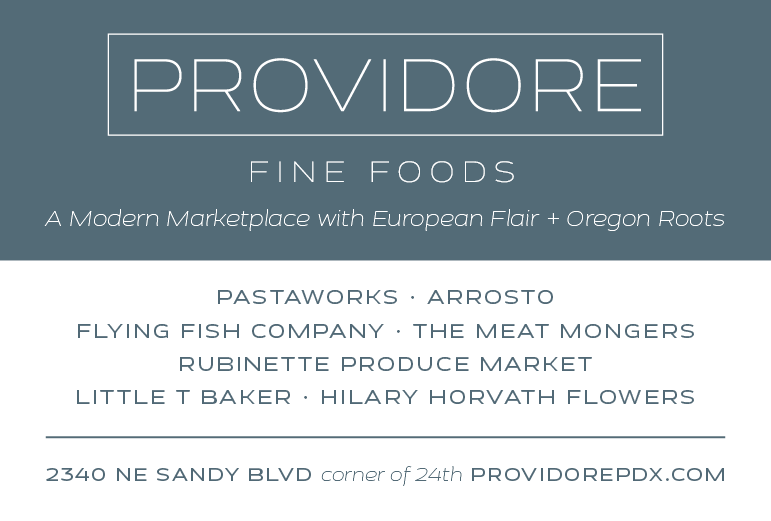 They know their vendors like family, they've watched them grow up, get married, have families, grow old. They haggle like siblings over the price of this or the freshness of that. And they laugh and tease and roll their eyes at each other's jokes. 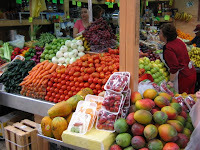 This market takes up an entire city block in the middle of the Centro, or historic district in the center of the city. It's a covered, colonnaded structure from the turn of the century built in an Art Nouveau style that is known for its selection of meats, produce and dried goods. There are even little grocery stores scattered around inside it that sell everything else, from canned tuna to toilet paper. 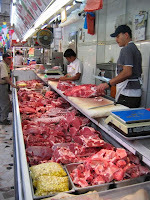 The meat market occupies one corner and you can find everything from beef to pork and chicken to fish, all fresh and many cut to order. When we were there the vendors were just putting out the day's offerings and there was much whacking apart of large hunks of meat and bantering with early customers. 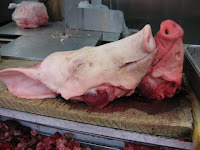 One butcher playfully poked his very long, sharp knife at a colleague from a nearby stand who was giving him a hard time, at least that's what it looked like from the way they were laughing with each other. And there was no squeamishness in evidence over the nasty bits that Americans consider not fit to eat, much less proudly display front and center in the meat case. 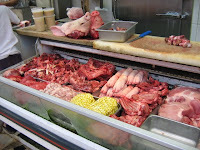 Innards, feet, fat and tongue were displayed right along with the prime cuts of loin, steak and breast, because they know what we've forgotten, and that is that some of these "other" parts have some of the best flavor in the animal. Whether marinated, braised or slow-smoked, you can get ten times the flavor from these cuts. Combine them with beans and vegetables and you've got stomach-filling and soul-satisfying meals for a crowd. Don't these piggies look happy? 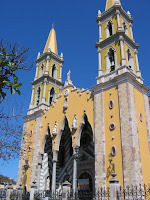 Read the other posts about my trip to Mazatlan: The Historic Scene, The Fungus Among Us, Evening on the Plazuela Machado, Groovy Graffiti, Bewitching Breakfast and Adios. Yes, you heard it right. We're down in Mexico for a few days of vacationing thanks to a generous donation from my mother and a friend who has a condo in the lovely city of Mazatlan. This week is Semana Santa or Holy Week, and the town is packed with Mexicans on vacation with their families. It's crazy and exciting to witness a culture celebrate one of its most important holidays, and I can't wait for Easter Day to see what happens. The weather is sunny and highs are in the mid-80s with a lovely breeze blowing in off the marina where we're ensconced in the simple luxury of our friend's condo. 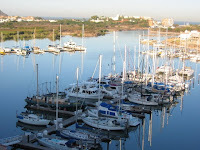 It's a small place, with two bedrooms and a deck off the living room that overlooks the marina on the north end of town. Historic home waiting for help (click to see open roof). Yesterday she and her husband escorted us to the historic district in the center of the old city. The colonial architecture is phenomenal, especially the buildings that have been restored and returned to their original status as private homes, but also those that have been repurposed as bed and breakfasts or shops. What's incredible to me is that they survived at all rather than being razed for new development. Read the other posts about my trip to Mazatlan: The Mercado Central, The Fungus Among Us, Evening on the Plazuela Machado, Groovy Graffiti, Bewitching Breakfast and Adios. 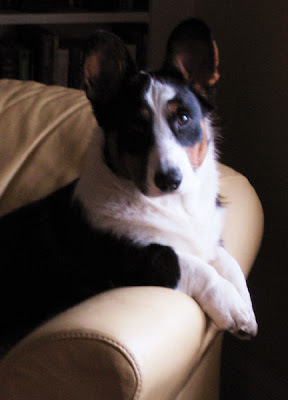 ...it's my blog and I can post what I want, a gratuitous picture of our little man on his 8-month birthday. When I read Tami Parr's very creative comic book-style recipe for yogurt cheese, I knew I would be making it in the near future. 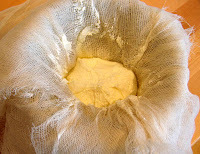 So Sunday I cut up some cheesecloth that was sitting in a drawer, dumped in a pint of whole milk yogurt, tied it up and hung it over the sink to drain for three hours. Her recipe says that after hanging for about an hour it'll have the consistency of a Greek-style thick yogurt, and after three hours it'll be about as thick as cream cheese. And since I needed a little spread to take to dinner that night but not a lot of time to spend making something, this was just the ticket. Seriously, this took maybe fifteen minutes to do and I was able to get all my other chores done while it drained. Then, when the three hours was up, all I did was pulverize some herbs and salt in the mortar and pestle (the salt crystals help to grind the herbs, a technique I heard from John Gorham at Toro Bravo) and mix them into the cheese. 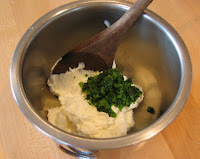 Depending on the tartness of the yogurt you use it may have a tang to it, but let it sit for an hour after you mix in the herbs and it'll be great spread on crackers. Plus it's cool to tell people you made the cheese! One of the best parts of our kitchen remodel was replacing our really cool but uninsulated and underpowered vintage 1920s stove with a brand new Jenn-Air downdraft model with big funky handles and plenty of BTUs. It also came with an interchangeable burner/grill/griddle cartridge system that Dave has fallen head-over-heels in love with. And, since he's the one who does the big breakfast production numbers around here, he particularly digs the non-stick griddle for doing batches of pancakes, bacon and fried eggs. 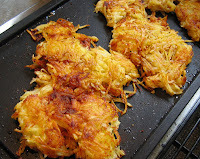 But to my mind the best thing he does is hash browns made with grated potatoes and onions, garlic and a nice sprinkling of Spanish smoked paprika. With some of those fried eggs and bacon and a little salsa, this has got to be one of my favorite big breakfasts ever. Melt butter on griddle or in cast iron frying pan. Mix potatoes, onions and garlic together and place on griddle, spreading them out no thicker than 1/2". Sprinkle with paprika, salt and pepper. Turn as they brown and keep turning until they're cooked through. Adjust seasonings and serve. Everything we'd heard had been good. And the time had finally come. Lucca had been open since January on the corner of 24th and Fremont, just blocks from our house, and from all reports it had been slammed since the day it opened. 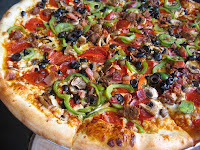 We were scheduled to meet a friend that evening and, since none of us had tried it yet, we went for an early dinner. Arriving a little before 6 o'clock, we got the last table for four. It was a Saturday night and there were a couple of larger groups celebrating various events, as well as several families with small children. Our waitress had a charming Italian accent and brought drinks and wine quickly, and the mussels and crostini we ordered for appetizers came within minutes. The mussels were simmered in a broth of garlic, artichoke hearts and butter and were superb. 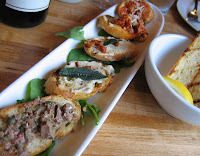 The crostini, two crusts each of paté, a white bean spread and a bolognese sauce were good, though I could have eaten six crusts of the pate alone, it was that exceptional. For entrées, we had a sausage pizza from their wood oven and though it was not as bubbly as Nostrana's, it was nicely browned and lightly sauced. If they can keep up the quality or even do better, this place is going to hit it big. 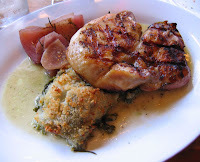 Dave had their grilled chicken cooked under a brick, big pieces of chicken that were moist and tender and came with a side of a chard gratin. I went with the short ribs braised in chianti with a side of creamy polenta and roasted root veggies that was fall-apart tender and luscious, not to mention quite filling. With a bottle of Barbera d'Alba from their very reasonably priced wine list, this was a great meal for a very moderate price. The room was a little noisy for my tastes, but it looked like they were working on a few fixes to bring the decibel level down. And if you have a group, they do take reservations but try to keep most of the room open for walk-ins. A nice shared dinner with wine at the bar would be a great way to go and even cheaper. We'll be walking up there this summer for sure! I've said before that there are recipes I go back to again and again, classic family dishes that I can make almost without thinking about them. Like fruit crisp or carbonara. Not that they're perfect, or the quintessential example of the form but, darn it, we like them. One is my version of an Italian marinara, or tomato sauce, that I call "20 Minute Tomato Sauce" because it's easy to put together and can be consumed almost immediately over pasta. 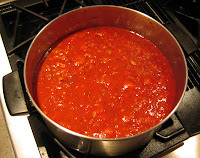 Or you can simmer it all day and have a rich, textured sauce for pasta or lasagne, or even use it as a braising sauce for pot roast. This one I made with a pound of spicy Italian sausage thrown in, a favorite with my guys, but it's great with no meat at all. 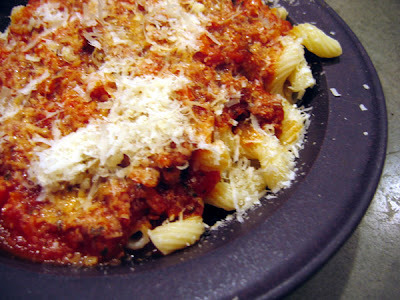 Or if there's some leftover roast in the fridge you can turn it into what we call "Meaty Meat Sauce." It's the beauty of these recipes, really. They're adaptable to what's on hand, easy to pull together and totally delicious. 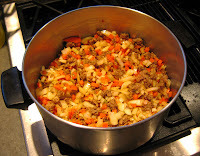 Sauté onion, garlic, carrot and celery in large Dutch oven (I use my 25-year-old Revereware pan) for about 8 min. or until onion is transparent and carrots are tender. Add spices and stir to warm. Add pureed tomatoes, tomato paste and wine. Simmer as long as you like, from one hour to all day. And, of course, it's terrific the next day or the next week. Options: Sausage, browned and broken up, as mentioned above. Or, for a little heat, sauté a couple of whole red chiles with the vegetables and remove before serving. This recipe is completely flexible and virtually indestructible, so have at it. Read more recipes in The Basics series: House Vinaigrette, Chile Sauce, Caesar Salad and Strata.